Arizona Cardinals quarterback Drew Stanton said he wasn’t surprised by running back Kerwynn Williams’ breakout game Week 14. Williams, who had never before gotten an NFL carry, ran 19 times for 100 yards in the win over Kansas City. Williams is a 5-8, 198-pounder out of Utah State who went in the seventh round of the 2013 draft to the Colts. 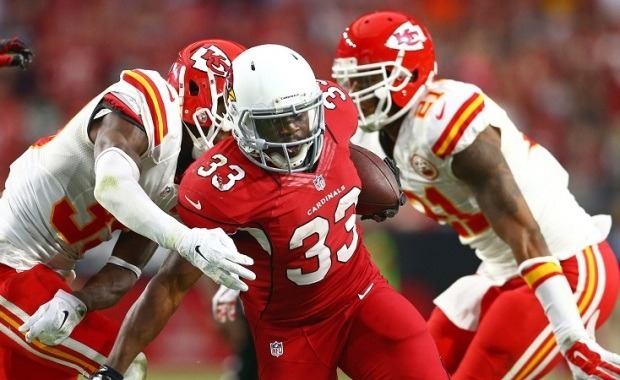 With Andre Ellington out for the season due to a hernia injury, Williams and Stepfan Taylor are Arizona’s top two backfield options. “We’re trying to get [Williams] in space and give him the ability because he has that home run-hitting capability,” Stanton said. “Within that, you try and get him in space. You try to give him the opportunity to go out there and showcase his ability. He’s so smooth in and out of cuts and makes stuff look easy. Williams and the Cards head to St. Louis to play the Rams on Thursday.